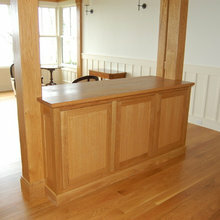 Kitchen, bars, entertainment centers, vanities, built-in, custom millwork. 1 Project for Horgan Millwork, Inc.
2 Reviews for Horgan Millwork, Inc.
Horgan Millwork built the cabinets for my kitchen. The design used two sections of a hexagonal main space which transitions into an adjacent dining room. Scott Horgan and his designer David Coursey produced a layout that created a linear flow from pantry cabinet and fridge (food storage) to cooktop, sink and stoves (food prep) to cabinets, wine fridge and bar (food delivery) at the dining room. The unique design was further challenged by the lack of a single 90 degree wall angle, resulting in a remarkable five sided dual oven cabinet. 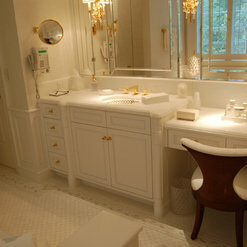 The high quality of the cabinetry; material, fit, finish and function, is astounding. 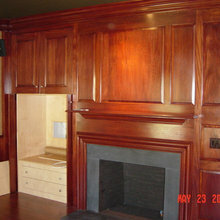 Horgan MIllwork provides the highest quality cabinetry and Millwork. They are creative, accessible and very service oriented. 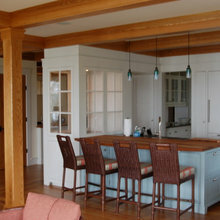 Competitive pricing and in house design make them our go to resource for cabinetry in New England. 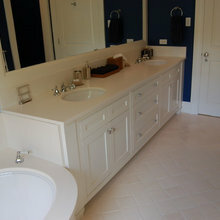 7 Ideabooks for Horgan Millwork, Inc.